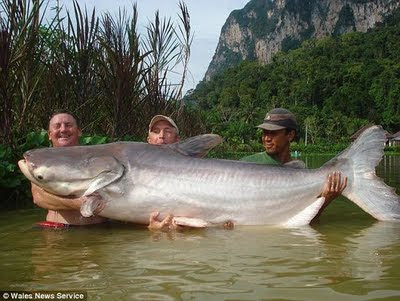 Dai Kent from Tenby in Wales has recently been announced IGFA record holder after landing a world record catfish in Thailand after a 55 minute battle last November. The 7-feet long monster weighed 260 Pounds (about 120kg) and if you can believe it, was caught on a "tiny piece of corn" according to Kent. Kent, 54, a retired Royal Navy officer was delighted with his catch - he is used to catching 4 and 5-pound bass on the Pembrokeshire Coast in Wales. The previous record Mekong Catfish was 191 pounds.